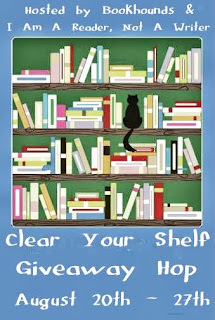 Welcome to my giveaway for the Clear Your Shelf Giveaway Hop, hosted by Bookhounds and I Am A Reader, Not A Writer. Must be able to enter and receive winnings by law. Must live in the US. You must be at least 13 years old to enter. Please ensure that you correctly enter your email (and check your junk mail folder if I'm not on your contact list) so that I have a way to contact you. You can read my giveaway policy on my policies page. Void where prohibited by law. Enter via the Rafflecopter below and then scroll down to hop to the next stop! It looks also like it is beckoning to you. Like come to me. Powers of persuasion!